Japanese Mini-Movie 04: "Pikachu's Nervous Hide-and-Seek"
American Mini-Movie 04: "Pikachu's PikaBoo"
When the first publicity for Pokémon 4Ever was released, fans were concerned that the lack of any mention of the mini-movie meant that it wasn't being dubbed. And, sure enough, when fans went to the theatres, the mini-movie was nowhere to be found. 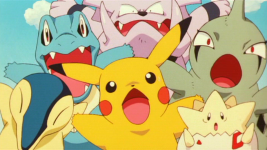 Fans speculated that perhaps "Pikachu's Nervous Hide-and-Seek" would find its way to the DVD, and when it was announced that the short would be on the DVD, fans had yet another reason to pick up Miramax's first Pokémon DVD. Presented as a special feature on the DVD, the mini-movie finally made its dubbed debut on the day the DVD was released in America, March 18th, 2003. The mini-movie itself is the best-looking one yet animation-wise, and the ways in which the various pokemon hide themselves is kinda clever. However, there's a lot about this short that doesn't make any sense. Who in the world would make a lawnmower with buzzsaws and hedgeclippers and jumping capabilities and that could survive underwater? Why was it trying so hard to mow all the pokemon down, as if it had some sort of grudge against them? And why did leading it into an empty shed finally defeat it? I dunno, but even though the short left me scratching my head, I enjoyed it nonetheless. Dub-wise, there are no edits to report. 4Kids even kept all the Japanese music, save for the opening and ending themes (of course). The title screen was different, of course, but everything else is uncut. Yay. Whaleko keeps its Japanese voice. The opening theme for the English version is called "Pikachu's Coming," and it's by Neil Jason. The ending theme is an instrumental version of that song. To tell the truth, I was surprised that there even was an ending credits sequence for the American version, and it's nice to see the appropriate people get credit for their work on the short. <>Speaking of the ending theme, the animation in the Japanese version was really special. The American version is just a black screen with credits and an instrumental version of the opening theme, but the Japanese version features great claymation versions of all the short's pokemon. It's all pretty random and has no purpose (just like the short itself), but it's fun. I realize that 4Kids may have had trouble using the ending images from the first three mini-movies since those were pretty much just fan art (and the legal issues involving fanart are just too sticky for 4Kids to mess with), but I doubt there was anything legally keeping them from showing these great claymation art.